The plan has just upgraded to a new filter grinder for our coarse grinding needs; for our French Press/Cafetières, and our house bulk-brew filter. We have replaced our ancient Santos with a Bunn. I chose this grinder for the cafe after an extended period of research into grinders that I have been generally immersed in (at home also) for quite some time. The Bunn is a beast (! ), but does a very good job. 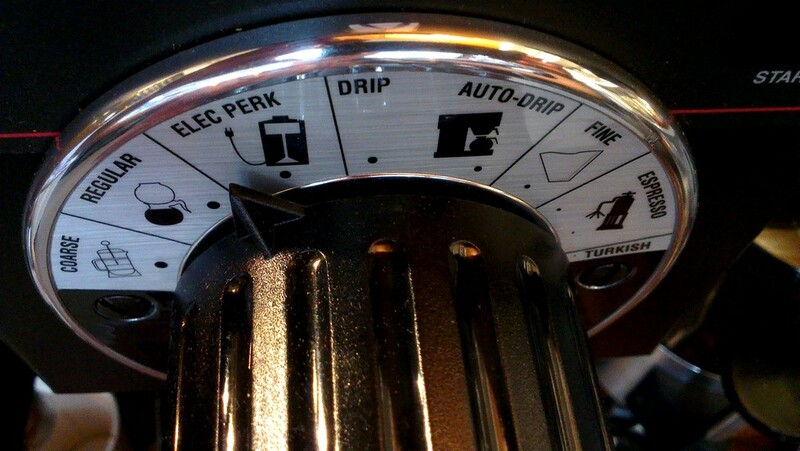 This simultaneously gives us a vastly superior grind quality, and greater scope for adjustments and fine-tuning. This is in conjunction with some recent refinements to the brew method for our cafetières that I’ve implemented for the cafe. This recipe is one I have gradually developed and fine tuned over a couple of years, and it is now our standard protocol. My intention with this has been to replicate as closely as possible the results of the ‘Cupping‘ method, only in French Press format. Cupping gives the most sincere and unadulterated expression of any coffee’s flavour. As a brew method, the humble cafetière (French Press), has the potential to be closer to this than almost any other way of brewing coffee, and I’ve designed our brew recipe for our cafetières to recreate the results of Cupping as closely as possible. One happy (and deliberate) consequence of this is that it can allow one to experience the development of the brew over time, in a way comparable to cupping (where the majority of the grounds are left in the cupping bowl steeping in contact with the brew, and the liquid then repeatedly assessed over half an hour, or much longer, as the mixture gradually cools and infuses further). You could ask for an extra cup, and decant the whole cafetière at 5-6 minutes to prevent any risk of the often quoted ‘over extraction’, or, with our recipe, you can also see how the brew develops over time, by pouring and enjoying your first cup at around 5-6 minutes (very soon after the prepared cafetière is served to you at your table, and you have plunged it), and then pour your second cup 5, 10, even 30 minutes later, and, if anything, potentially be rewarded by an even more developed final cup! Either way, if drinking the brew black (where you’ll be most able to taste all the subtle flavours more clearly), please consider allowing it to cool a little …or a LOT! The closer coffee comes to body or even room temperature, the more the brew will ‘open up’, and the better your mouth will be able to perceive all the flavours present. The new streamlined system for our daily Cafetière offerings (see the previous post below), is working wonderfully. As intended, this now allows me to select a smaller range of the newest in-season coffees at the roastery, and change these more fluidly and frequently. This means the coffees are always the newest crops, and the smaller range also means coffees are always within their optimal freshness from roast (a huge variety of beans sitting around on shelves makes for stale coffee!). This does also mean there are now no longer tasting notes printed on menus on the tables (the day’s selection is written on the blackboards instead) – but I always ensure that key tasting notes, and provenance information, is made available to all staff for every coffee on offer – and so if you would like to know more about any coffee before making your choice – just ask! Also, we are upgrading the coffee used for our standard house bulk-brew filter coffee. This is the coffee for those that just want a ‘normal, none-of-that-nonsense’, quick, coffee that tastes ‘like coffee’! But the coffee used for this, whilst meeting those requirements, should, I believe, still be special: freshly roasted, traceable, and seasonal, just like all our other coffees for espresso and cafetière have been for a long time now. But finding something that meets this balanced need suitably and consistently is very important, and has taken some time. But now, we are finally moving from the more generic continental blend that we have used for the bulk-brew filter for a long time, which was lagging way behind the quality of all our other espresso and cafetière coffees, which I source separately from James’ Gourmet Coffee Roasters. Now we are going to be using something wonderful for the bulk-brew filter as well – but it will still be super approachable, and not too wacky! This will be a coffee from Union Hand Roasted coffee (a top London-based roaster). Our other coffees – the Espresso of the Day, and our daily selection of coffees for cafetière/French Press (see below) will continue to be predominantly from our awesome roaster, James’ Gourmet Coffee, and also from equally fantastic Guest Roasters occasionally too. EVERYTHING now freshly roasted, ground to order, in-season, speciality grade, and fully traceable! All from TOP UK craft roasters! Happy days!! I’ve just released the newest menu for the cafe… with a twist! A positive change to the system means this might be the final ‘menu’ to go out on the tables… because now the coffees of the day for cafetière will be on blackboards in the cafe rather than printed on menus. This is a move I have wanted to make for some time. It allows us to change coffees more fluidly and frequently. The info below explains all this in more detail. Therefore this ‘menu’ for the tables simply provides some general information about the sorts of coffees we use. Better! See the Cafetiere blackboards for today’s choices – or just ask a member of staff about the coffees that are available. Our coffees for both Cafetiere and espresso are freshly roasted by our expert craft-roaster, James’ Gourmet Coffee, in Ross on Wye, and are freshly ground and brewed to order by our baristas. Just like our ‘Espresso of the Day’, the coffees for Cafetiere will change regularly, so that we can offer you the most current In-Season crops from around the world, as soon as the freshest and most exciting coffees come into the roastery. These coffees are single estates, farms, and cooperatives, or even single varietal Micro-Lots which are from select parts of single estates. Each will have its own unique natural flavour characteristics derived from the specific terroir, Arabica varietal, and processing of the cherries at the farm. There is just a small selection each day – crucially, this enables us to ensure that the coffees can always be at their optimum freshness from roast. All our coffees are speciality grade Arabica coffees, which are traceable to these individual farms growing them in origin. They are sourced on quality first and foremost, but are also ethically traded, because the growers receive a premium price for their exceptional produce (equal to or even often well in excess of the ‘fair trade’ price). You can find out more about all these coffees by asking our baristas, or on our roaster’s website, James’ Gourmet Coffee.com, and also on our Head Barista’s website, The Bean Vagrant.com. To launch the new system, today we had Guatemalan Finca Providencia, Antiguan Finca Entre Volcanes Bethel Micro-Lot, and Kenyan blend of Makwa Esate with Ngutu Mill Coop. But now these can, and will, change regularly …at the drop of a hat! NEW coffees for cafetiere out NOW! Sparkling, juicy citrus. Syrupy sweetness. Composed of mixed Heirloom Arabica varietals. From the Limu region of Ethiopia. Process: Fully washed. Floral, fruit tea-like, with apricotty stone fruit notes. Geisha is one of the rarest and most coveted coffee varietals. It originated in Ethiopia, and has become especially famous in recent years, after a Geisha lot from Panama fetched record prices at auction. This lot is from the Viphya region, in the northern highlands of Malawi. Process: Natural. A blend of Ethiopian specialty grade coffees. This coffee is all about sweetness, fruit, and the essence of great Ethiopian coffees this season. Named after the old English word for Ethiopia: Habesha. Very low acidity, with a spicy, musky, woody flavour. Decaf is available on request. Traceable, Ethically traded, Speciality Coffees. Freshly craft-roasted by James’s Gourmet Coffee. New seasonal coffees for cafetiere menu! …I plan to have this up and running within the next two weeks! Our brand new, much researched, much lusted-after ‘2nd revision’ Anfim Super Caimano with a timer mod allowing two preset doses, arrives at the cafe. Wow! Awesome grinder. Exciting, lovely new coffees for cafeteire menu due to hit the cafe next week! An exceptionally, clean, bright and fruity coffee, with blackcurrant and grapefruit-citrus notes. From the Kairi Mill, Thika district, Central province. 99% is the famous SL28 Arabica varietal. Superb high altitude Tarrazu. Chocolate-cocoa body, with grapy acidity, and a twist of spice. From Carlos Ureña Ceciliano’s La Pira farm, Santa Maria de Dota. Caturra Arabica species. Great, balanced, dark chocolate cup with citrus and red fruits, and a champagne acidity. From Louis da Silver’s farm La Fany. Red Bourbon Arabica species. Ethiopian Specialty grade coffee. Named after the old English word for Ethiopia, “Habesha”. The coffee is taken to the coast at Malabar for drying, acquiring a unique aged taste that is full bodied , with very low acidity, and a spicy, musky, woody flavour. From Faiz Moosakutty’s Bibi Plantation in Sunticoppa, Southern India. This is a coffee roasted longer, to a higher temperature, which has caramelised further. The coffees used are sustainable lots, such as San Juan La Laguna & Cecocafen co-op from Nicaragua. The cup is savoury, and tasting of almost too much to be decaffeinated! This farm is from the San Ignacio area of Peru. More seasonal! More traceable! Streamlined range = Fresher! More single estate coffees! More character and quality! …And, with a little arm twisting, I also hope to ensure the coffees will now be freshly ground to order for every cafetiere – just like our espresso shots! All things I’ve been trying to introduce for a while. The issues now might just be silly plungers, and grind quality… more arm twisting! Gloria arrives at the plan! Single estate coffees for espresso can be a real challenge, but can be wonderful when prepared successfully, whilst also providing interest, variety, and exciting new flavours for everyone! We’re now serving James’ Gourmet Coffee Co’s fantastic Formula 6 for our espresso at the plan – although other equally delicious blends and single-origin beans will be making frequent appearances too! The amazing Operation Cherry Red bean in my competition blend was never going to last forever, and besides, I felt it was time for something new! Formula 6, on the other hand, is a wonderfully balanced, carefully constructed, constantly modified, multi-faceted treat – that is amazing both on its own, or with milk, in ristretto cappuccinos. There’s so much going on in this espresso – but not in a ‘busy’ way – just so many flavours that come together harmoniously and make sense. It has a magical, soft, sweet brightness, that’s balanced perfectly with body and depth. I feel F6 says pretty much everything that needs to be said about the standard of espresso I want to be serving at the cafe, and it will no doubt be a regular at the plan – but in the interest of variety, experimentation, fun, and to hint at the wide spectrum of tastes within coffee, I will also be regularly selecting some other coffees for espresso from the exciting offerings at JGC, to serve at the cafe. The espresso side of things at the plan has just gone from strength to strength over the last couple of years, and in terms of the beans themselves, it’s now quite hard to imagine how the quality of the coffee we use could be any better (although there are quality growers all round the world doing their best to achieve just that, as we speak). The key now lies in how skillfully and diligently myself and the other staff prepare the espresso, and the machinery we use to do this. Hence there are always things that can be improved, and plenty to aspire to. Firstly, being in Ross on Wye, JGC are more local. Secondly, in developing the coffee I used for the UKBC, I was able to experience first hand JGC’s amazing coffees, their commitment to quality, their expertise, and a genuine passion for the coffee itself. …And coffee that is ethically traded. This issue of ‘fair’ or ‘ethical’ trade coffee is a complex one, but I’ve found it to be intrinsically linked to the quality of what I try to do with coffee. Sometimes customers seem to worry that without the Fairtrade brand logo on a coffee, it’s not really fair trade. Sadly, some people fear that ‘ethically traded’ is just a marketing buzzword designed to fob them off with an inferior, less ethical product. In the case of some companies, that may be true! However, through relationships, a little research, and knowledge of the craft, I trust the sourcing strategies of our suppliers. This sourcing strategy is first and foremost quality based. This orientation towards quality leads these specialist importers to seek-out the most amazing coffees, and to then pay a premium price for premium beans. This price often far exceeds the price available via the Fairtrade vehicle (as admirable as this may be within the wider coffee market). And this isn’t just a grab-and-dash pillaging of the best coffees in the best seasons, abandoning the growers a year later – many of the relationships associated with this level of coffee are sustained and long-term commitments, on both sides, to continually improve the quality of the crop, the harvesting, and the processing – with the incentive of higher prices for a better product. These relationships are hence meaningful and sustainable, benefiting the entire community where the coffee is grown, along with everyone else in the chain of quality from plant to cup. Like Monmouth Coffee, JGC source a lot of green coffee through Mercanta and other speciality buyers working with similar objectives, as well as directly. If you’re still not convinced, you can read what Mercanta have to say on their site, and then (with some more research too, perhaps) (like this article by Steve Leighton) make up your own mind! We are currently serving my competition espresso blend at the plan. It’s a really exiting and unique espresso coffee, which I’m proud to have access to, and which helped me to win 1st place and Best Espresso at the Wales and West heat of the official UKBC 2009. Come in and try some! This is a 50/50 blend of Operation Cherry Red Ethiopian Sidamo Natural Process, and Brazilian Fazenda Cacheoira Natural Pulped Bourbon! …And our espresso can now be termed fair trade, as Monmouth Coffee and their supplier have direct relationships with the growers of these premium coffees, and agree a fair price for them – in many instances, the growers will actually receive a better price than they might from the more recognised Fairtrade brand. At present, the blend contains Brazilian, Colombian and Guatemalan beans, with the addition of an Indian bean expected later in the year. Good guide, some great everyday rules for everyone to help with better espresso production. Have you thought about including bean freshness, I consider this the most important factor in great espresso! Thanks – sometimes I worry that I pitch the content on the site too simplistically for pro baristi/coffee geeks, and too advanced for the average person – therefore running the risk of making it of no interest to anyone! So it’s good to get some positive feedback. As for bean freshness, I do insist on things like only putting as many beans in the hopper as we know will be used within the shift, and keeping any opened bags well-sealed in our cool, dark coffee cupboard. As for the freshness of the beans in terms of the elasped time from roast date, I don’t have complete control over this. We currently use Torelli Perla Bianca, which is a bought-in, pre-packaged, valve-bag blend. To be fair, it’s really quite nice, and our local supplier orders small amounts on demand, so we recieve coffee that’s not too far from it’s roast date (always within three months) (this is far from really fresh, I know, but the valve bags are pretty good, and I’m sure many beans used commercially are even older). What I’d really like of course though, is to have access to really freshly roasted beans – or eventually to do this ourselves in-situ. But I’m not aware of any decent local roasters, and doing it properly yourself takes a great deal of specialist roasting knowledge … and like I say, this aspect’s a bit out of my hands anyway. It’s enough of a struggle trying to get people to take to take basic barista techniques seriously at the moment, without bringing the highest quality beans into the equation!